Gripzo introduces different grip sizes to provide security for odd size tablets. 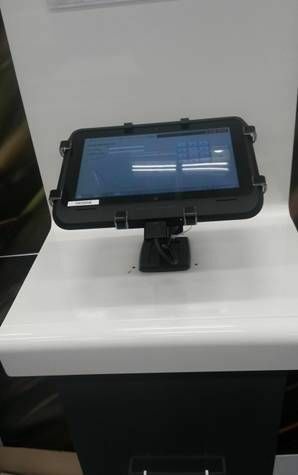 Retailers are using tablets more and more on the shop floor. All sorts of assisted sales tasks are carried out on the shop floor rather than at the office. However, the tablets used often require a secure docking station or the so-called ‘countertop cradles’. Gripzo now offers tablet security mounts with a grip set allowing these odd size tablets to slide in the security mount. Gripzo offers grip sets with different inch sizes and in combination with various tablet thicknesses with or without protective covers around them. The Gripzo ‘odd size’ tablet brackets can hold tablets such as the Panasonic Toughpad and the HP ElitePad. Tablets used in enterprises or retail are often used with a cover to protect them against damage when they fall or are hit an object. Companies like Gumdrop, Griffin and Survivor all supply custom made protective covers. Gripzo offers security tablet mounts to hold and protect tablets against unauthorised removal. Special grip sets are now available to hold tablets with a protective cover. Mail us at info@gripzo.com to get confirmation if your tablet with cover will fit in case of doubt. Read more on how Gripzo deals with tablets with protective covers.